SNES Super Demo World: The Legend Continues (any v1.1) "warps" in 18:23.02 by PangaeaPanga. This movie is nearly 45 seconds shorter than the previous movie. 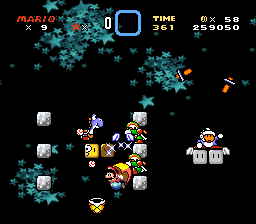 The author accomplished this feat by implementing a different route to Bowser and flying under the lava. See the author's comments for more details.